Hi, does any one have any wiring information about the multifunction sat nav wheel? My wife uses a kliktronic to change gear and I am looking to use the left and right movement of the wheel to trigger up and down gear changes. Hi Ian, great news that your wife ride still rides. I have a friend who recently had a below knee amputation( left leg), so I passed the Kliktronic info onto him. Sorry Ican't help you with a wiring diagram, and i have only used the 'wheel' a little bit, but I find it very 'cheap & plasticy' (if that makes sense), and I am not sure how it will stand up to being used frequently(I am sure there will be more gear changes then scrolling through the Nav screens). Just keep that in mind. She currently has two buttons on the left hand side which are on a bracket clamped to the hand grip, upsets my engineering blood as it looks a bit bodged. We are in France for a couple of weeks so may see if she can live with it there. I am not positive about this, but if you are not using the wheel for GPS functions, then you may be able to remove it(it's just plastic) and put your buttons where it was situated. Just a thought. Went this way to mount my headset remote in this place but ended up putting it all back as it was. The handle and the NAV wheel can be separated but the regained space was then unprotected and not suited for my remote. I am led to believe that if you remove the wheel, the best way forward is to replace the handgrip on that side with a non wheel one. I’d rather try and tap into the wheels connection to use the left and right movement. I’ve had the wheel on an adventurer previously and I’d stood up to my hamfisted use so no reason to believe it won’t do what I want. If it’s low current I can use a relay to switch power. It might be worth asking on other forums for other BMW bikes, like the GS and RS, UKGSER if you dare! Here is a pic of the multicontroller (wonderwheel) wiring diagram. 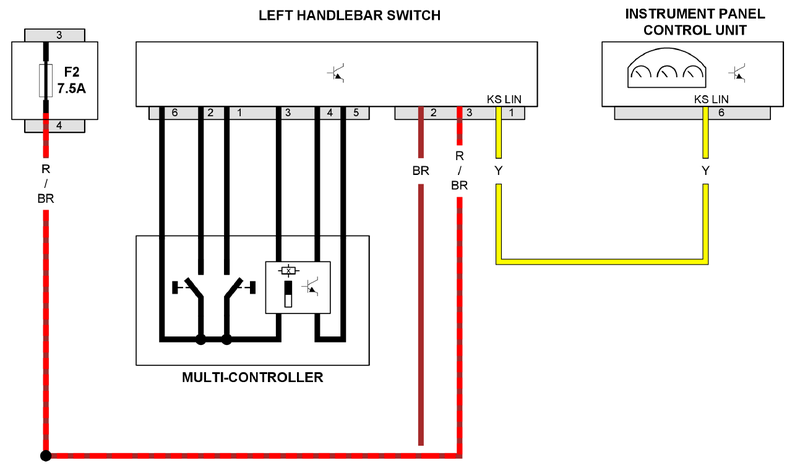 The multicontroller gives input to the instrument cluster control module via LIN - unless you are about hacking the multiplex signals running across the LIN, then I would recommend just testing the multicontroller outputs to find the signal you need. Its hard to tell which is which but it would be fairly easy to read with a multimeter - there is only scroll up & down, left and right + click. That’s perfect, looks like pins 1, 2 and 6 with a bit of wiring and a relay will do the trick.